Sometimes fruit shows up in strange places. The first picture, from flickr user kasiaeryn, is of bottles of eau de vie de poire, also known as pear brandy. Pear brandy, like other fruit brandies, is made from juice, in this case pear of course, that’s been fermented and then distilled (not to be confused with fruit liqueurs, where fruit flavoring is added to an already-made alcohol such as vodka). But how do you get the pear in there? The trick is to slide the bottle over the pear while it’s still young, tiny, and on the branch. The bottle is held in place with string, and over time, the pear grows to full size inside the bottle. Care must be taken to seal off the bottle neck, e.g. with gauze, so that insects can’t get in, and to tilt it so that moisture can drain out. Other leaves and young pears on the same branch can be trimmed to avoid interfering with the growth of the main, or “king”, pear. Though the “prisonnier” (the fruit trapped inside the bottle) looks neat, according to this New York Times article it doesn’t change the flavor at all. 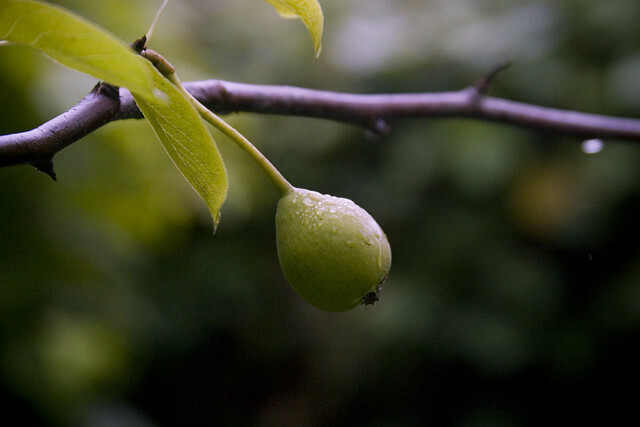 I’d guess that the waxy skin of the pear might prevent the alcohol from penetrating the fruit; or perhaps it’s because properly distilled fruit brandy tastes so similar to the fruit itself that its presence makes little difference? Check out the New York Times article, too, for lots of other interesting details on fruit brandies. Among other brandies that are available: wild strawberry, rose hip, and quince.